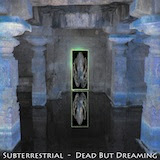 succubusacumen: Subterrestrial - "Dead But Dreaming"
Subterrestrial - "Dead But Dreaming"
"Dead But Dreaming" is a dark ambient tribute to H.P. Lovecraft, a virtual soundtrack to the Cthulu Mythos. Creeping atmospheres inspired by the ancient nightmares portrayed in his fiction work.